Coconut oil is believed to be one of the best natural nutrition for hair. 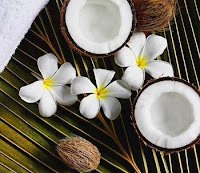 Coconut oil is extensively used in the Polynesia and the Indian sub-continent for hair care providing Polynesian and East Indian women with their trademark thick and shiny hair. It helps in healthy growth of hair providing a beautiful shine. Regular massage of the head with coconut oil ensures that your scalp is free of dandruff, lice, and lice eggs, and reduce dry scalp. It is an excellent conditioner and helps in the re-growth of damaged hair. It also provides the essential proteins required for nourishing damaged hair. It is therefore used as hair care oil and used in manufacturing various conditioners, and dandruff relief creams. With regular use, you can treat yourself to intense moisturizing that strengthens and nourishes your hair. Certain components in it keep the hair strong, vitalized, nourished and protected from effects of ageing. Let us see those components and their effects on hair. Vitamin-E – Almost every aptly educated person knows the importance of vitamin-E for skin and hair. It keeps scalp healthy and hair rejuvenated. Moisture Retaining Capacity – Coconut Oil has high moisture retaining capacity, since it is not broken down easily nor evaporated, being very stable. It does not let moisture escape thus keeping hair moistened and soft. This prevents breakage of hair. Coconut Oil is a far better conditioner for hair than any synthetic one available in the market. Anti-Dandruff – The various fatty acids present in Coconut Oil serve as very good anti dandruff agents and are way better than any anti dandruff shampoo. A regular application can help you get rid of dandruffs for ever . Lauric Acid – One of the most responsible reasons behind hair fall and hair loss is microbial action on the scalp and hair roots. So, to protect hair against them, what we need is an antimicrobial agent. Lauric Acid present in Coconut Oil is one of them. It is basically a triglyceride which yields a monoglyceride called Monolaurin when acted upon by a species of bacteria which breaks the glycerol bonds. This monolaurin has excellent antimicrobial properties. Capric Acid – This is yet another triglyceride present in Coconut oil, which, like Lauric Acid, yields another monoglyceride called Monocaprin due to bacterial action, having antimicrobial properties similar to that of monolaurin. Some shampoos strip your hair of its natural oils. That’s why you have to use a hair conditioner to prevent dry, brittle hair. The only problem is some hair conditioners don’t really replace your natural hair oils. They simply coat the hair shaft, giving you the illusion of healthy hair. Virgin coconut oil is proven to replenish the vital oils that give your hair shine and bounce. Dry damaged hair can easily break and leads to split ends. Virgin coconut oil strengthens the hair shaft, reducing split ends and hair breakage. Many contend that EVCO is the ultimate in organic hair care and is one of the best ways to treat and moisturize the hair shaft. If you’re looking for a natural way to thicken and moisturize your hair, give it a try!